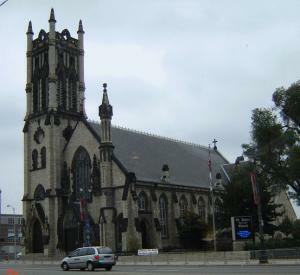 The venerable St. John's Episcopal Church of Detroit. 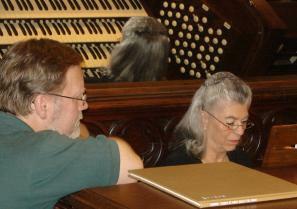 Richard Newman, MaryAnn Balduf and Marshall Dicks check out some music while Ken Holden and Terry Jankowski assay the organ console in the background. 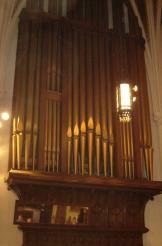 Four manuals and a bunch of ranks comprise the chancel organ. Click here for the complete stop list, courtesy of Charles Kennedy. Click here to LISTEN. Marshall Dicks pays attention as MaryAnn Balduf prepares to play. Terry Jankowski takes his turn. 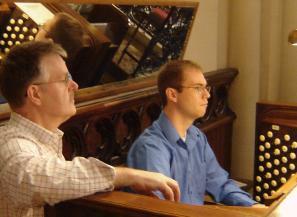 Huw Lewis demonstrates the Casavant, opus 1549 in the chapel. Watch (requires Quicktime or Realplayer). The specifications can be seen by clicking now. 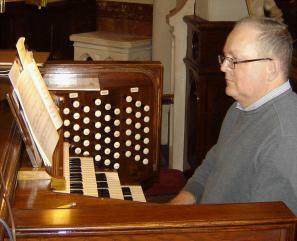 Ray Arhens plays some Bach. Jim Wilkes takes a point from Huw Lewis. Richard Newman plays some William Albright. 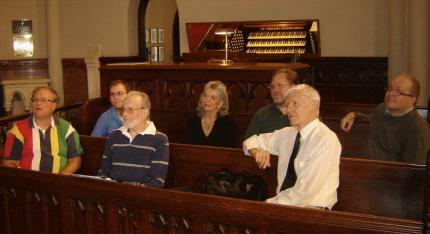 The September 2009 meeting of the Michigan Chapter of the Organ Historical Society convened at St. John's Episcopal Church of Detroit. Present were Ray Ahrens, Carl Balduf, MaryAnn Balduf, Marshall Dicks, Ken Holden, Terry Jankowski and Jim Wilkes. The meeting was graciously hosted by Dr. Huw Lewis, Organist and Master of the Choir, and Richard Newman, St. John's Edwards Organ Scholar. Carl Balduf called the meeting to order at approximately 9:45 a.m., at which time the minutes were approved as printed on the Web site, plus hard copies available at the meeting. 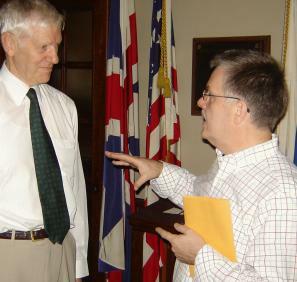 The Treasurer's report was then submitted by Terry Jankowski and accepted as read. The report can be found below. Old business: We are still looking for a place to archive Chapter historical documents. No conclusions were reached. New Business: In the absence of Steven Ball, Chapter Vice President, Balduf announced that a November 14 meeting has been scheduled at St. John's UCC in Wyandotte. 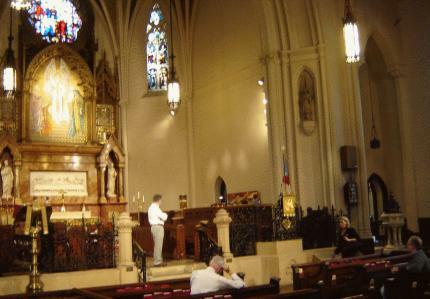 The organ is a Barton, with an antiphonal and an antiphonal console. This will soon be added to the Meeting Notice page. The group also discussed traveling to the Holland and Grand Rapids area for a meeting in the spring. Those present thought it would be a fine idea. October 11 at 3 p.m., MaryAnn Balduf; Fayette Opera House, Fayette Ohio. 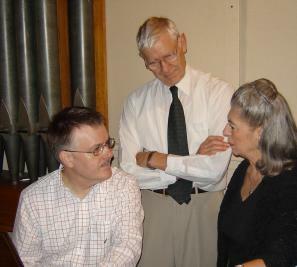 October 25 at 4 p.m., Timothy Huth, James Nissan and MaryAnn Balduf; First Presbyterian Church of Dearborn. 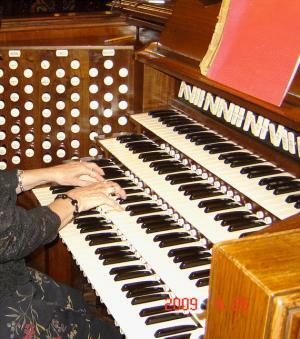 November 1 at 5 p.m., Norah Duncan; The IHM Motherhouse Chapel, Monroe, Michigan. A motion to adjourn was then made and seconded. The motion carried and the meeting was adjourned until October 24 at the First Presbyterian Church, Ypsilanti. Then followed a delightful demonstration of the organs by Huw Lewis and Richard Newman, open console time and luncheon at The Hockeytown Cafė. 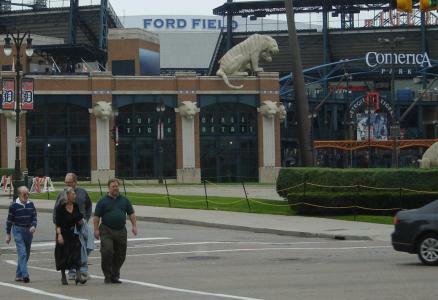 The OHSers cross Woodward Avenue on the way to lunch at the Hockeytown cafė. 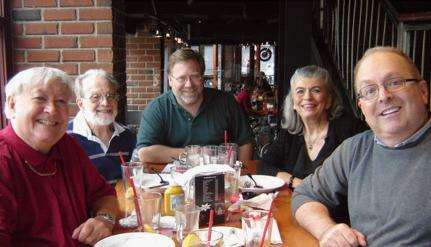 And a good time was had by (l-r) Carl Balduf, Ken Holden, Marshall Dicks, MaryAnn Balduf and Ray Ahrens after lunch at the Hockeytown Cafė. 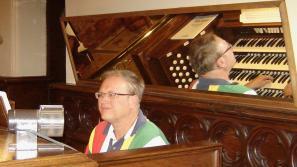 Huw Lewis and Richard Newman provided the group with a 20-minute romp through every organ stop. 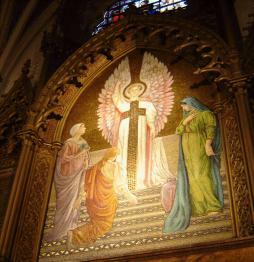 The super reredos above the altar. The facade pipes actually play. 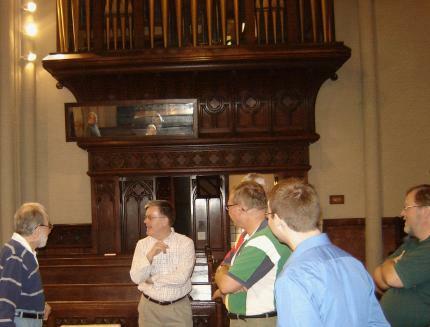 A lively discussion of the organ's long and varied history. Rapt attention is paid to Dr. Lewis' comments. 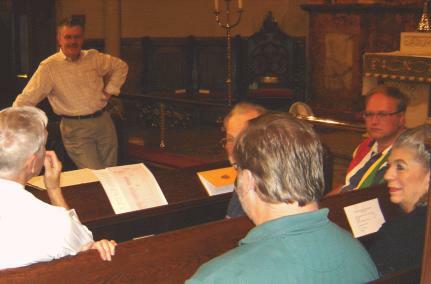 Shown, left to right, are Terry Jankowski, Richard Newman, Ken Holden, MaryAnn Balduf, Marshall Dicks, Jim Wilkes and Ray Ahrens. More lively discussion is mirrored under the pipes.